Mahama Refugee Camp. The camp extends as far as the eye can see. Almost 50,000 people live here. They are all refugees after having fled Burundi in recent months. A series of tents. A series of lives. A series of stories. “If it weren’t for Caritas we would be dead.” “If Caritas goes we are going to die, they are the only ones who care about us.” If the proposals that I hear every day seem a bit disproportionate, they nevertheless represent the need of the assistance provided by Caritas Rwanda and the beneficiaries’ recognition of the project over the course of recent months. It is in this huge camp that Caritas Rwanda decided to set up an emergency project to serve the most vulnerable people from the outset of the crisis in Burundi in April 2015, which forced thousands of Burundians to flee their country towards bordering states including Rwanda. Who are the most vulnerable that Caritas Rwanda has supported for more than a year through its nutritional programme? They are those who are handicapped, elderly, chronically ill, and women who are breastfeeding. Aside to finding themselves outside of their own country, without resources, stuck in a camp, they also have to face their health problems, and they received basic nutrition which does not take their specific needs into account. Global humanitarian aid cannot address the details, but Caritas, at a smaller scale, can. Every month there are roughly 5,000 people who receive nutrition adapted to their specific needs and conditions. Some of these people are reunited in front of me, flanked by numerous project volunteers, all Burundians. They gather here like a big family, because the name Caritas signifies “love” today. Some of them already know Caritas for its work in Burundi, others have discovered it in the camp. In the tent a “family reunion” is underway to exchange ideas on the project, their satisfaction, their needs, questions and ideas. A young handicapped girl speaks. She thanks Caritas and fears that one day the organisation will cease its presence here. So she wants Caritas to put together some groups of mutual aid, some small projects for ongoing action, so that they can become autonomous. A simple demand. No need for large funds, nor complex projects. Responding to the needs clearly expressed by the beneficiaries themselves, because they know better than us: that’s what Caritas Rwanda tries to do. Today a new project has been launched taking these needs into account. 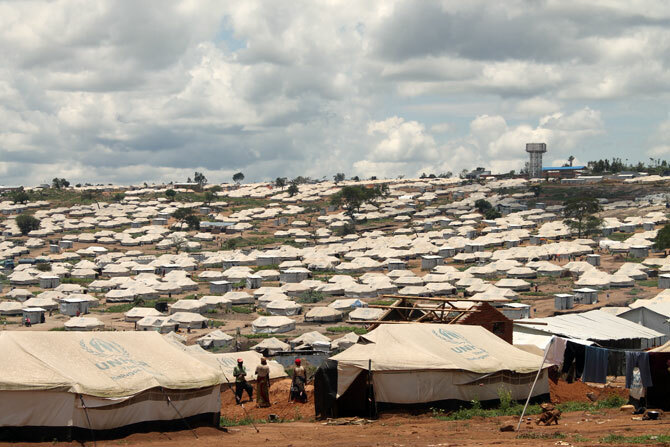 The climate of instability and insecurity continues in Burundi and the total number of Burundian refugees registered in Rwanda has not stopped rising since March 2015. Today, there are about 74,000 according to MIDIMAR (Ministry of Disaster Management and Refugee Affairs) spread out in Mahama camp and urban zones. Caritas Rwanda itself has decided to continue its operation in Mahama camp for an extra year. Caritas’ action is part of the continuity of the initial nutritional project, going further than emergency aid, and lasting over a longer term, to help refugees to face their situation in the camp, which is likely to continue. The project underway, launched in May 2016, aims to provide nutritional assistance to more than 5,000 vulnerable people, of which 3,000 are breastfeeding women, 1,200 are people aged over 60, 520 are handicapped and 780 are chronically ill or live with HIV or AIDS. All these people receive daily nutritional supplements linked to their specific needs for a year. Furthermore, 500 people will be accompanied as part of a psycho-social support programme during the same period. Finally, some training and some revenue-generating activities will be put in place, as well as some activities to foster peace. As with the previous projects, the programme is coordinating with other individuals working in the camp, under the authority of MIDIMAR and HCR. The beneficiaries that are concerned about Caritas’ departure can be reassured: Caritas Rwanda has planned to accompany them through thick and thin and to relieve their suffering for a long time further. Maybe as long as they are there. The return of the refugees is hardly conceivable today and for many the exile is due to endure for some years still.